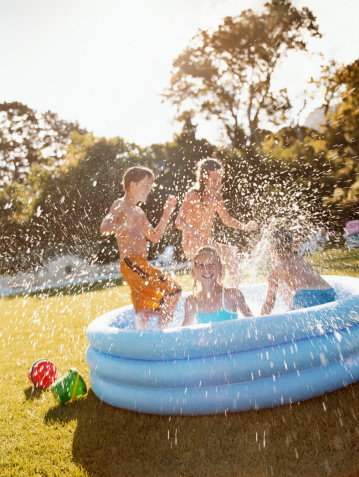 When it comes to inflatable pool gear, holes happen -- even if you think you've been careful handling your favorite flotation devices. Instead of going through several sets of the same inflatables each season, repair minor holes yourself using a patch kit designed for the material the floats are made from; it's important to use the right type of patch kit; otherwise, the repair may not adhere. 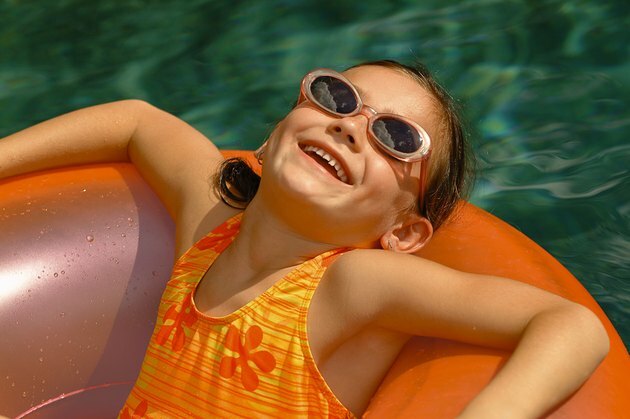 Repair kits designed for pools and pool floats can be found at pool stores. Finding the source of escaping air may seem a tricky proposition if the leak is slow, but in reality, that same air helps you spot the leak. Inflate the leaky pool float completely and close its air valve. Place the float in the pool and submerge one part of the float at a time, looking for a stream of air bubbles. If you're unable to do this in a pool, a bathtub or kiddie pool will suffice. Rotate the inflatable, submerging it as much as possible, until you've found the source of the leak. Brush the water away from the area and stick a piece of masking tape near the hole so you can find it later. While pool and vinyl repair kits accomplish the same thing, they're not all created equal. Some kits work only on vinyl and vinyl-covered floats, while others are designed for rubber or other materials. If unsure what your pool float is made from, visit the manufacturer's website or call the company's information line to find out. Dry off the pool float, or at least the area requiring the repair. Clean the area surrounding the hole with the wipes included in the repair kit, or with rubbing alcohol on a soft cloth. Deflate the float, then smooth it flat so the damaged area faces up and has at least an inch of material around it. Peel the backing off the repair patch, then smooth it over the hole so that the patch extends an inch around all sides of the hole. To keep the patch flat as you apply it, work from one end to another, smoothing your hand over the patch as you stick it down. Wait at least 30 minutes -- or as recommended on the patch kit instructions -- before inflating the pool toy. Instead of a patch, a tube-based waterproof sealant may be used to repair small holes, as well as holes on seam areas where a patch won't suffice. Choose a sealant designed for the type of material your float is made from, then deflate and dry the float. Clean the area surrounding the damage with rubbing alcohol, then allow it to dry. Note that some surfaces should be roughened with sandpaper prior to cleaning; follow the manufacturer's directions. Apply a bead of sealant over the damaged area, smoothing it out with your finger or a plastic card, such as an expired gift card. Make sure the sealant extends at least 1/2 inch beyond the hole. Allow it to cure as directed before re-inflating the float.